PigSpigot is an online, user-generated greeting card company that allows customers to send hilarious e-cards, Tweeting cards, and snail-mail cards to friends and family. 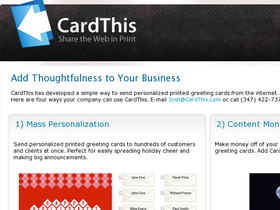 PigSpigot makes greeting cards fast, easy and personal. You select a card - pigspigot.com prints it and mails it. Free handwriting font and shipping included. Stop by 58coupons first for best pigspigot.com promotions, discounts and savings. Enjoy free shipping on all cards from pigspigot.com. Follow this link to order yours today. Visit pigspigot.com and enjoy a great selection of free e-cards. Click link to get started. Tweet greeting cards from PigSpigot for free! Click link for details. Buy beautiful greeting cards at pigspigot.com from only $4 with shipping included. Click link.